Presentation - Site de lejardindemamereeng ! "Rather than responding to the academic criteria of the art of landscape gardening-the Pure Aesthetic- I have created a garden for living, uniting all essential functions: the beautiful, the good, the useful and the agreeable. A varied, abundant garden, alerting all five senses throughout the year. An area mixing: now the structural, now the free, now the exceptional and now the ordinary, always with a concern for harmonious and aesthetic balance. A welcoming place for small visitors such as birds and other small animals ". A collection of trees and ornamental shrubs chosen for their originality. According to the season: prunus, malus, maples, magnolias, viburnums, cornus, cotinus, hydrangeas and other more rare species such as Wollemi pine and a magnificent Heptacodium or, more commonly, fruit trees trained in espalier or cordon, hardy suite plants and grasses and yew and box topiaries. In addition, pergolas, arches, and other structures displaying a large collection of old, wild and English roses in a cameo of pink white and purple tones. A real passion fed, from the start, by a love of the richness, the variety of forms, the colors and the perfume of roses, which led very quickly to the creation of an historical and botanical collection; to discover and to share. They represent, for the most part, the majority of existing families, with a marked favor for older roses, those obtained and cultivated in Europe at the beginning of the nineteenth century and of inestimable value as the originators of the rose as an ornamental plant: The Alba, Gallica, Damas, Centifolia, Muscosa and Portland. 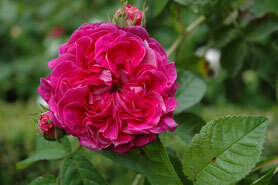 The major preoccupation of the garden is the Gallica roses, with over 80 of the 250 still in existence today. "Faced with the historical importance of this species, the difficulties in maintaining all the remaining varieties and because of not having sufficient space in Le Jardin de ma mère, I am creating, in a neighboring village, a second garden consecrated uniquely to the repatriation of those Gallica roses still available. By the end of 2015 it will feature more than 200 roses, and, because it will serve as conservation, this very structured rose garden will differentiate, and agreeably complement my first garden".